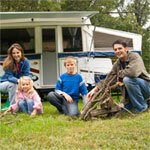 North Country Rivers offers RV camping on the Kennebec River in Bingham Maine. We offer a great vacation option for family, couples and all RV campers; including private showers, washrooms, a restaurant, a pub, a game room, outdoor recreation areas, and a retail store. - All RV camping sites have fire rings, picnic tables, shower house on-site, full electric (20, 30 & 50 amp hook ups), water hook up and on-site dump station. When you RV camp with North Country Rivers, you'll have fun, and camp in comfort! Whether you're visiting us alone, as a couple, or as part of a large group, you have the best-possible services at hand - period. We want your whitewater river rafting trip, ATV riding trip, or any other of our many Maine adventure packages to be best that it can be! North Country Rivers has three different camping options. and just like with our cabin rentals, we also offer packages that combine camping with whitewater rafting trips, ATV riding trips, Moose and wildlife watching Safaris, etc. 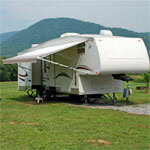 Our RV Campground is located at 36 Main St, Bingham Maine. All sites have fire rings, picnic tables, shower house on-site, full electric (20, 30 & 50 amp hook ups), water hook up and on-site dump station. For additional questions regarding our Maine camping and cabin rentals, and our our adventure vacation trip packages, please contact us at 1-800-348-8871 (toll free in the US and Canada), or e-mail us. Our trip specialists will be happy to work with you to setup the ideal Maine vacation!